DescriptionBig, soft and colorful playmat. · 4 coloured base panels with fun, comical illustrations and textures. · Extremely soft, appealing fabric centre. · Sides can be raised for a cosier environment. We've chosen this soft colorful activity playmat on request on one of our customer. 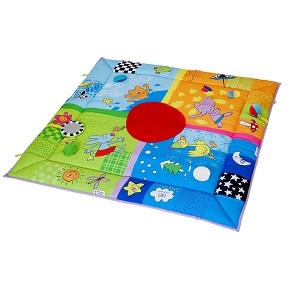 It will allow your child to play in the living room of your rented apartment in Paris on a soft padded mat. Rent a bucket of toys together with this playmat and baby will enjoy the full set for funny times in Paris, while parents are resting after long walks in Paris. As for all our products, we do deliver this booster seat to your address, on appointment and will show you how to install it.